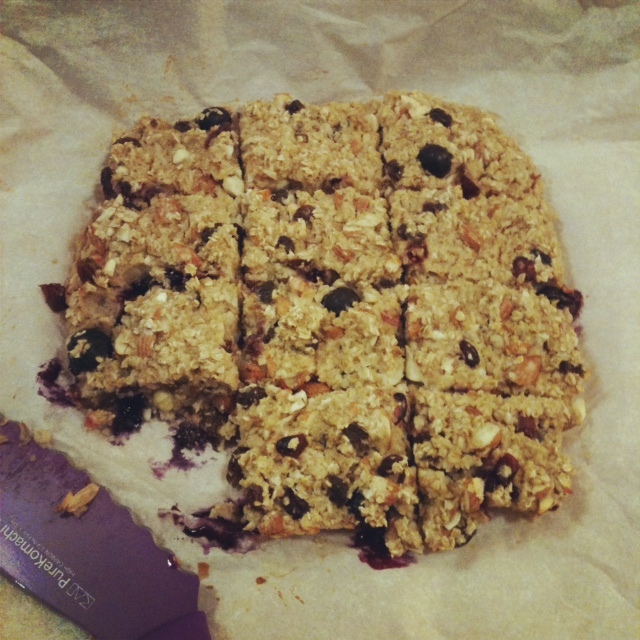 discordia: Feed the Hunger Monster Oatmeal Snack Bars! I'm one of those people who are prone to crankiness due to hunger... which may be putting it mildly. 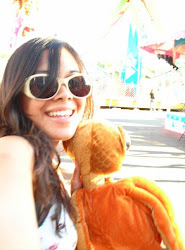 Ask anyone who loves me enough to stick around after I've gotten hungry and let loose the brat within, and they'll tell you I can be a wee bit unbearable those times. 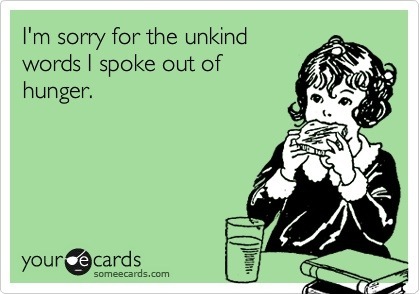 I'm not the only one; chances are you know someone or are yourself a cranky hungry person. I had to research this and I did find some interesting things. Of course it all leads back to brain chemistry: it turns out serotonin levels are affected when the body is hungry. Research from Cambridge University, cited in two articles I found in a quick search online (Huffington Post, US News), reveals that serotonin is needed to for different parts of the brain to communicate, and weakened communication can lead to *less rational* thoughts and behaviors. Interestingly, serotonin is also related to social dominance as it is particularly related to a perceived availability of resources - a.k.a FOOOOD. This "social dominance" affect can translate into agression in some vertebrates (including humans) when the perception of resources is low (see this 2002 Stanford University article). Evolutionarily, it might be more advantageous to scare off competitors with agression when there are limited resources. Unfortunately, this ancient hunger-agression hangs on in some of us, despite living in environments where food is more than abundant (we should talk about World Hunger in another article, though). That crankiness can kick in for some of us, to the annoyance to those around us. If you get two cranky hungry people in a room together, say, my sister and I, then you better find us some Lucky Charms or Edamame fast. There are certainly ways to avoid the bratty face of hunger: keep foods with high ratios of tryptophan to phenylalanine in your daily diet to boost serotonin. Such foods include rolled oats, avocados, walnuts, pumpkin seeds, dates, papaya, and bananas. 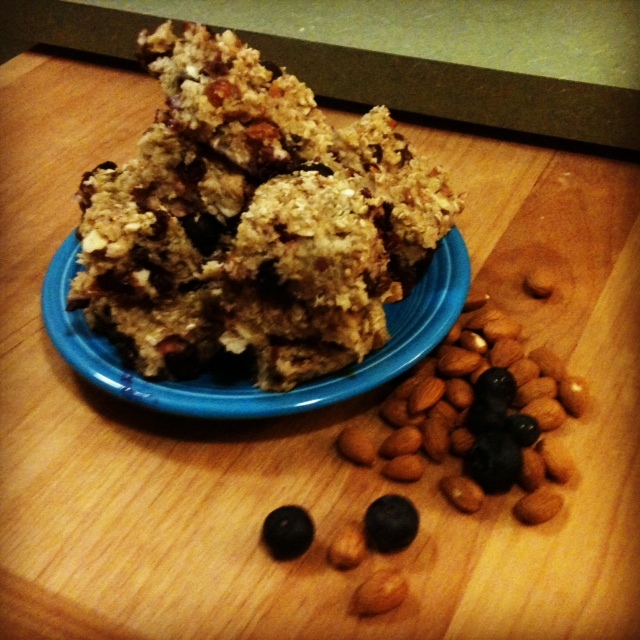 Luckily, many of those foods are tasty in an oatmeal snack bar! Ok, the story behind this recipe: I'm going on that long road trip soon (countdown: 2 days), and I know I will be hungry a lot. I'm hungry all the time in my normal life when I'm not on a bus for 15 hours with 45 teenagers. I tend to eat small amounts frequently throughout the day, keeping me satiated and not obnoxious. For the trip, I wanted to bring along something that would help me keep up those serotonin levels, but also pack well and be healthy. I also wanted to make something from scratch at home. So I looked up recipes for energy bars online. I found lots of good recipes, and one that stood out to me was from Kath Eats Real Food. It's really simple and looks delicious, but it uses milk and eggs, and I generally don't like to use milk and eggs when I can avoid them in my baking. So I changed it up a bit, adding applesauce and swapping in almond milk. It's like a science experiment! Preheat the oven to 350˚F. Mix oats through salt together in a large mixing bowl. In a separate bowl, mix Almond milk through vanilla - try to break up the honey as much as possible. Pour the almond milk mixture into the dry mixture, stirring to combine and evenly distribute the honey. Pour batter into lined pan and set in the middle rack of the oven. Bake for 40 minutes. Allow to cool in pan for 10 minutes, then remove to a rack until completely cooled before cutting. Cut into 12 squares. This bar is more like a muffin bar than it is a dense oatmeal or power bar, so be aware of that. Fresh out of the oven, it was like a light and fluffy blueberry muffin. I cut the pan into 12 bars and wrapped them individually in wax paper, then froze them. The next day, I popped one into my lunch bag to bring to work. By the time lunch rolled around, the bar was thawed and was more dense than the night before, so more like an oatmeal bar. I think the fresh fruit can be changed to pretty much any berry; you can sub in banana pieces or small apple chunks. It's not too sweet, which means it could pair well with some honey Greek yogurt, with some peanut butter smeared on it, or maybe some Nutella! I'll pack some of these up in my backpack to take on the bus to save the children from my hunger, and also to share! More snack/ breakfast/ protein bar recipes: Banana Oat Breakfast cookies, Skinny Taste Granola Bars, Cake Batter Energy bars (Chocolate Covered Katie has oodles of bar recipes), Energy Bars for Bicyclists See this interesting research on serotonin and agression from The Journal of Neuropsychiatry, and this interesting article about Muslim women's social and spiritual perception of fasting during Ramadan. Labels: applesauce, cranky, dairy-free, easy, egg-free, food, fruit, hangry, hungry, nuts, oatmeal bar, recipe, why does hunger make you grumpy?